Public Services - Revised Pay Scales, 2015 - Payment of Arrears for the period from 02.06.2014 to 28.02.2015 – Orders - Issued. Telangana Finance Department G.O.Ms.No. Dated: 23-05-2017. GO 91 Telangana PRC 2015 Arrears Payment from 2.6.14 to 28.2.15. Happy news for Telangana Government Employees and Teachers that the much awaited PRC Arrears for PRC 2015 orders have been released. Government have decided to pay the arrears of RPS, 2015 for the period from 02.06.2014 to 28.02.2015 and it is here by ordered that 50% of the arrears shall be paid in the financial year 2017-18 and the balance amount in 2018-19, in eighteen equal monthly instalments commencing from 1st July, 2017 along with monthly salary payable on 1st July, 2017 for the month of June, 2017. 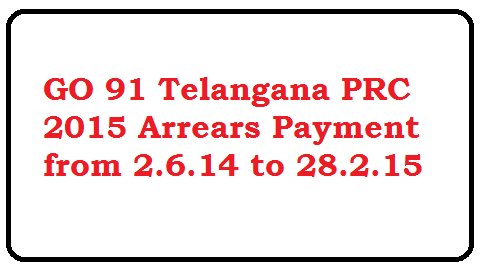 Telangana PRC 2015 Arrears Payment Orders GO. 1. G.O.Ms.No.25, Finance (HRM.IV) Department, dated: 18-03-2015. 2. Circular Memo.No.68/1/HRM.IV/2014,Finance (HRM.IV) Department, dated: 04-04-2015. In the Government order 1st read above, orders were issued implementing the Revised Pay Scales, 2015 w.e.f. 01.07.2013, allowing monetary benefit w.e.f. 02.06.2014 and cash payment from the month of March 2015. Regarding the arrears of salary from 02.06.2014 to 28.02.2015, it was ordered that the orders would be issued separately. 2. In the Circular Memo 2nd read above, it was directed that the pay fixation claims shall be prepared in three parts, out of which, Part-II shall contain the quantum of arrears to be paid for the period from 02.06.2014 to 28.02.2015. 3. Government have decided to pay the arrears of RPS, 2015 for the period from 02.06.2014 to 28.02.2015 and it is here by ordered that 50% of the arrears shall be paid in the financial year 2017-18 and the balance amount in 2018-19, in eighteen equal monthly instalments commencing from 1st July, 2017 along with monthly salary payable on 1st July, 2017 for the month of June, 2017. 4. The detailed circular instructions regarding the drawal procedure are being issued separately. 5. The Drawing and Disbursement Officers shall take utmost care while claiming these arrears and any lapses found in the matter will be viewed seriously. The DDOs shall comply with the provisions of the Income Tax Act as regards tax deduction at source.